It is important in Japan to make note of subtle differences in the language. To prove my point, I’ll use the example of Hi-Chew and Chū-hai (pronounced chew-hi). Both can be purchased at any convenience store in a variety of fruit flavors and contain a significant amount of sugar. One can be eaten by kids of all ages and one should be consumed responsibly by legal drinking age adults. Asking for one when you mean the other could have disastrous consequences. Hi-Chew candy is similar to a Starburst, maybe a little softer. 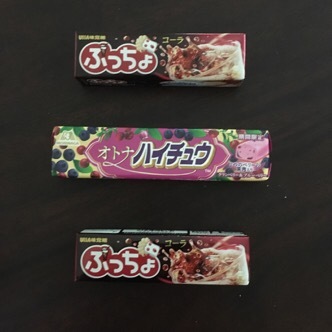 I have tried a variety of flavors and really like the banana and mixed berry the best. Chu-Hai is sold in aluminum cans in a rainbow for fruit flavors. The drink originates from the shōchū highball. The shōchū highball was made with the alcohol shōchū and carbonated water. 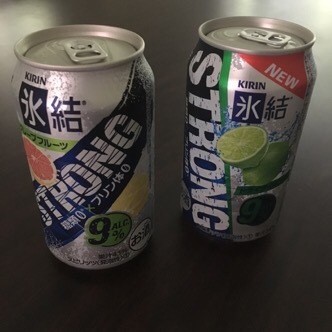 Now known as Chu-Hai, the canned drink is typically made with vodka, carbonated water and artificial fruit flavor. The alcohol content is also high – 9% or 18 proof. I have been cautioned of their potency from several people. Typically, I was warned of buying a fresh Chu-Hai from a stand in town. There is no regulation on the amount of vodka or other alcohol when made fresh. Often the first one goes down so easily, another is ordered and it becomes a night the person doesn’t remember. I haven’t been tempted to order one. Although, curiosity did get the better of me and I purchased two cans for “blog research.” They are both still in the refrigerator. I’ll post an update when we finally break one open. If I remember what happened… Until then, Kanpai! PS. Our shizzle arrives tomorrow! Good bye air mattress. HELLO sleep number, blender, couch, clothes, clothes and more clothes! Is this the new “Julia water”? Maybe. More research is required.